The purpose of this study was to examine the efficacy of CES for the treatment of mixed anxiety and depressive disorder (MAD) in children. This study used a randomized, sham controlled clinical trial design in which subjects in the active CES and sham groups had CES treatments for 15 days. The primary effectiveness endpoint was the change from baseline in the last post-treatment scores on the Zung Self-Rating Depression Scale (SDS) and the Zung Self-Rating Anxiety Scale (SAS) compared to the sham CES group at the endpoint of study. • Male or female children between 8 to 16 years of age. • Diagnosis of mixed anxiety and depression disorder (MAD) by a “specialist physician” prior to acceptance into the study (Experimental group only). • Must score > 40 on the combined scores of the SAS and SDS. • Subjects have taken drug therapy for MAD or emotional disorders. Subjects for the experimental group were randomly selected from children with MAD who met the criteria for entry into the study and who were patients at the Children’s Psychological Health Clinic at Nanjing Brain Hospital. Subjects for the control group were randomly selected from a group of children with emotional problems who were recommended by their teacher at elementary or middle schools in the city and met the > 40 score criteria on combined SAS and SDS scores but did not meet the diagnostic criteria for anxiety disorder or depressive disorder. Baselines measures were done prior to the first active or sham CES treatment and endpoint measures were done after the completion of the final CES treatment. The current of the active CES device was set at a comfortable level for the active group subjects, between 100 – 500 µA. The current of the sham CES device was increased until the sham subject felt a “skin sensation,” then decreased and shut off, so that the device did not emit electricity. Neither group felt any sensation from the device for the remainder of the treatment. The length of each treatment was 10-15 minutes. The treatment schedule was 5 daily CES treatments followed by 2 days off and then this schedule was repeated 2 more times. The Zung Self-Rating Anxiety Scale (SAS) and the Zung Self-Rating Depression Scale (SDS) were used to measure anxiety and depression. Both scales have established reliability and validity (Zung et al., 1971; 1965). There were 60 subjects in the study, 30 in each group. In the active CES group there were 25 males and 5 females. In the sham group there were 19 males and 11 females. All subjects were between 8 to 16 years of age. There were no significant differences in gender and age between the two groups. Chi-Square and ANOVA were used to analyze the data. 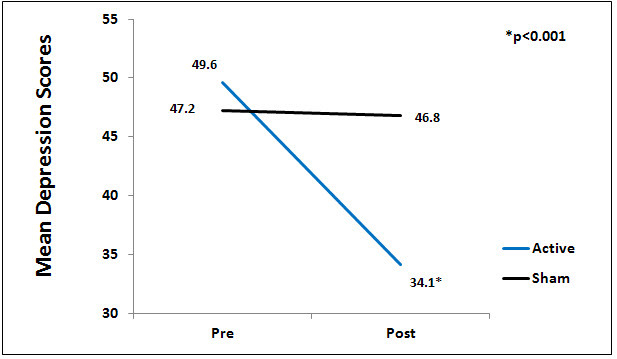 There was a significant difference between the active and sham groups for anxiety at endpoint of study (p<0.01), Figure 1. Figure 1. Mean Anxiety Scores by Group. There was a significant difference between the active and sham groups for depression at endpoint of study (p<0.01), Figure 2. Figure 2. Mean depression scores by group. Strengths of this clinical study are: the investigators used a randomized, sham controlled design; the diagnosis of MAD was verified by a physician prior to acceptance into the study for the experimental group; sham CES devices were the same as active CES devices except they did not emit electricity; and Based on the effect sizes for anxiety and depression in other Alpha-Stim® CES studies, this was an adequately powered study with an N of 60. A limitation of this study is that the sham group did not meet the criteria for MAD. One possible explanation for this is that recruitment of enough children with MAD was a problem. Other limitations are: the current for the active group (100 – 500 µA) and length of CES treatment (10 – 15 minutes) for all subjects were not the same. The findings from this study on the significant effect of CES on anxiety and depression are similar to those found by Lu in children (Lu et al., 2005) and in other Alpha-Stim® CES studies with adult subjects. Zung WWK, Richards CB, Short MJ. Self-rating depression scale in an outpatient clinic Further validation of the SDS. Arch Gen Psychiatry. 1965 Dec;13(6):508-15.